This route is graded ED-/6c/270m, 8 pitches. It has been opened by N. Potard, P. Dudas and P. Ducroz in 2004. There are a few bolts in place and take 2 racks of friends #0.3 to #3 and one #4 and 2x60m ropes. Here is the GPS Route from the Grands Montets to Argentiere Hut and then the start of the route (N45.95154, E7.01401). This track leads to the start of Versant Satanique, Voyage en Pierre Sainte, Rebuffat – Mazars and Rasta Metal. 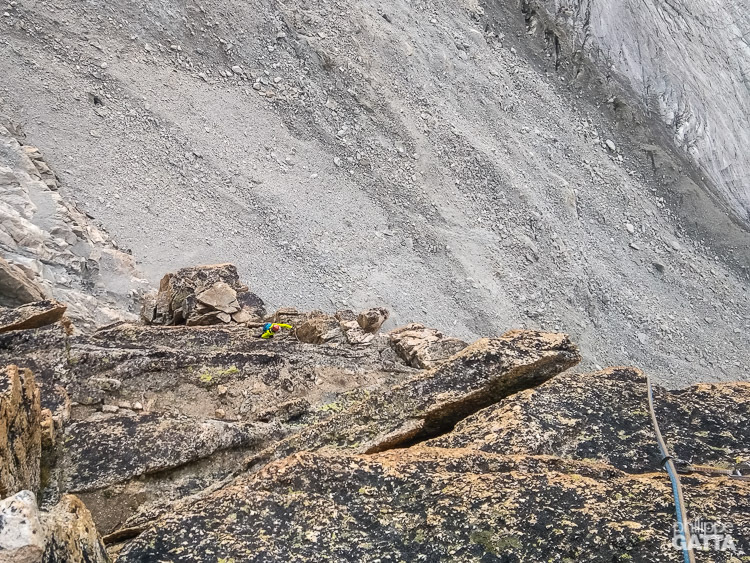 From there, climb a couloir of loose rock going up-right (photo above), pass the Rebuffat – Mazars to reach the start of the first pitch (photo below). 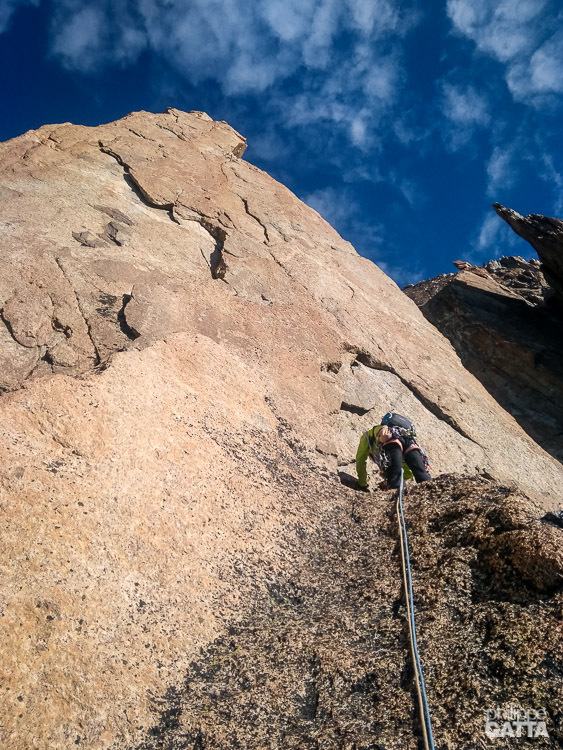 Pitch #1: graded 6a, it is more a solid 6a+ and exposed until you reach the drilled thread (first small roof). Technical and nice pitch. The anchor is on a shelf on the left at the end of the corner. Pitch #2: 6a, start straight above the anchor and then to the right (2 bolts), go left of the pillar and continue to its top. There is a first sling, continue to the real anchor a few meters above. 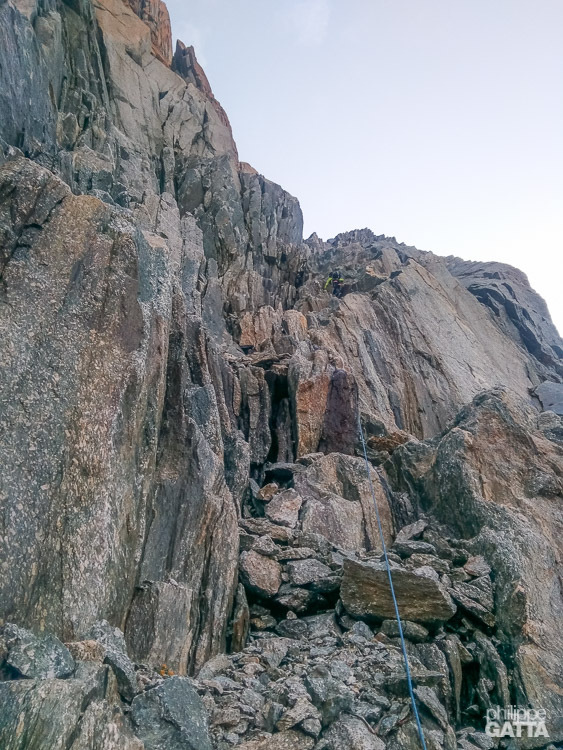 Pitch #2 bis: 4, climb an easy slab for 3m above the anchor and down climb a crack to the right toward a couloir, pass the pillar and reach the anchor behind. The leader should put some friends on his way down to the second won’t be in solo. The purpose of this pitch is to reach the corner of the pitch 3 and avoid the couloir to the right which is exposed to rock falls. Pitch #3: graded 6b but it feels more a solid 6b+, the harder pitch of the route in my opinion. 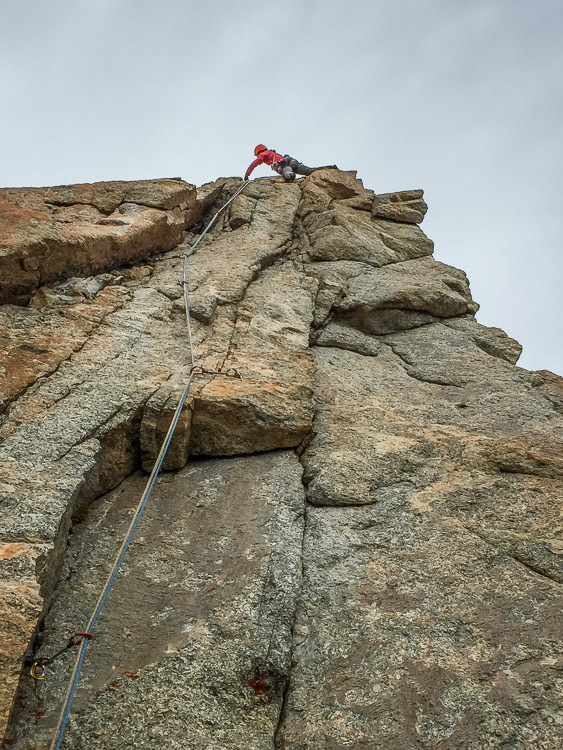 Climb the obvious corner above the anchor, physical with some easier sections. Relatively easy to protect. Pitch #4: 6a+. Climb the corner, physical and a bit bouldery but shorter pitch. Pitch #4: 6a+. Climb the corner, physical and a bit bouldery at the end but shorter pitch. Pitch #5: 6a, probably more 5b/c. Climb the series of shelves and short wall to the base of the steep wall above, 45m. Note the anchor a couple of meters up and left. Use it on the way down to avoid rope jam. Pitch #6: 6c, probably a 6b+. 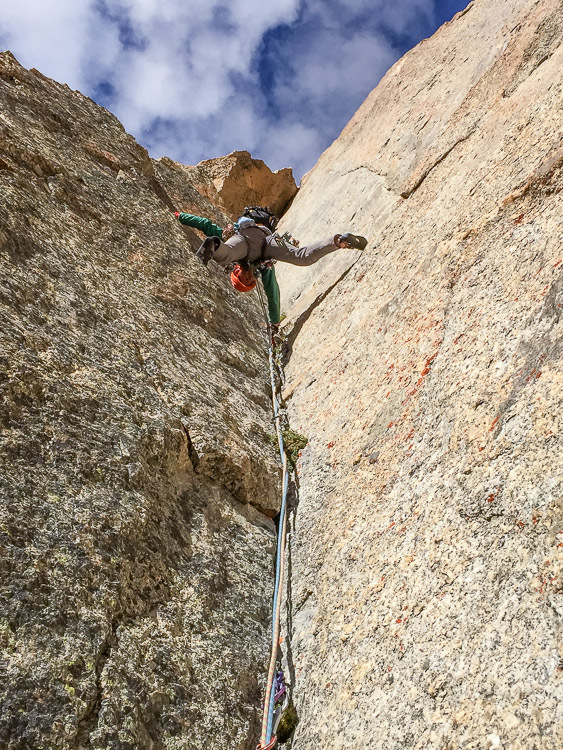 Climb straight up to the first bolt, traverse to the crack on the left (2nd bolt) and continue in the crack, go left of the pillar toward the end (easier, 40m). An easy pitch leads to the top of the first tower. Abseil down in the route, using the anchor mentioned above. 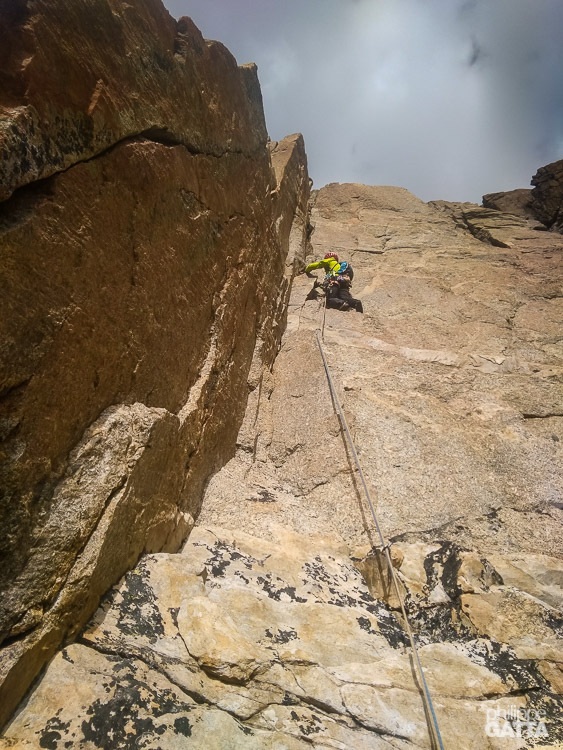 Once at the bottom of the route, down climb 10 meters or so to reach an anchor, use it to abseil down straight to the snow field, avoiding the first couloir (60 meters rope required). 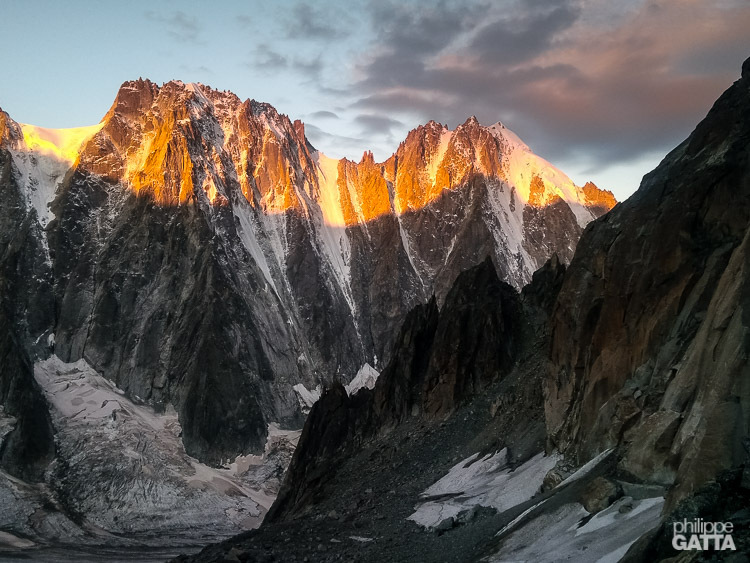 This entry was posted in Alpinism and tagged Argentiere hut, Minaret, Rasta Metal. Bookmark the permalink. Both comments and trackbacks are currently closed.